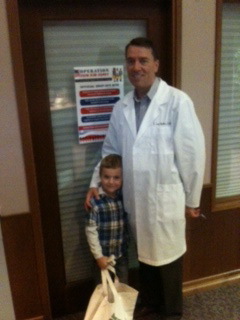 Local Tri-City dentists and heath care professionals are taking candy away from kids again! But it is all for a good cause. For the third year running Dr. Ostler and several other area health professionals plus Numerica Credit Union are joining together to send a message of health to the community, and collecting leftover candy to send to the troops as a way of saying thanks. The local veterans group “Operation Thank You” is also helping by shipping the candy in care packages to active military serving and protecting our freedoms. The service men and women use the candy for a nice treat, but mostly to help in the work of getting information from the “locals” in the war theater about hidden dangers. Kids get $1 a pound and can sign a thank-you card that goes to the troops. The story is being carried on local TV and newspaper and on the internet. Those interested in donating (or selling) their excess Halloween candy can bring their candy to Dr. Ostler’s dental office in Richland, or find another drop-off site by going to www.operationcashforcandy.com. We want to thank the local media for covering this story and event, and say thanks to Numerica Credit Union and as well as the many area health professionals who are part of this project. We wish everyone a happy and safe and healthy Halloween. On a dental health note: Remember to brush, and use caution in overdoing the candy! Dental decay is promoted in the presence of sugar and in the absence of controlling bacteria levels with good tooth brushing and flossing. Also, please consider using products with Xylitol (a 5-carbon sugar) which helps fight against tooth decay. For more information about this and other dental health issues please feel welcome to come and visit with us, or to bring it up with your dental health professional at your next visit. Can Dental Care Save Your Life? New Research Says “YES”! Six Mistakes Parents Make: Advice for Parents! Headaches and TMJ – Taking the bite out of headaches! What is Gum Disease, Really? Does Your Child Have the Best Healthy Start? Sedation Dentistry – The Perfect Solution if You Are You Afraid of the Dentist!